I’m taking a stand this year: My son is not taking the standardized state tests that are being mandated by the government. His school will receive a zero for my opting him out, which will lower his school’s proficiency standings. On one hand, I feel bad that his school is being punished for my decision; his school has wonderful teachers and administrators. But it is not me who is punishing the school: Our government is punishing them. On the other hand, as Ian’s mom, I am ultimately responsible for his education. I believe 100% that this test will do more harm than good to my child. #1: Ian does not learn the way other children learn. When he was four years old, we discovered Ian had a cancerous brain tumor. He had it surgically removed, which was followed by radiation and chemotherapy. The treatments were successful, but it came at a price: A void was left where the tumor was, and brain cells were damaged from the treatments. His brain has had to make new neurological connections. I am confident that Ian’s brain will eventually make those connections and learning new things will become easier for him, but it will take time. In the meantime, we have to find innovative ways to help Ian be as successful as possible in school right now, much like other children who are more creative than logical/sequential learners. Even though Ian is functioning well physically, visually, and verbally, the biggest problem is his memory. He struggles with holding onto new information, which is essential when learning to read and learning math facts. I know this about him. His teachers know this about him. If the government wants to know this about him, they could immediately get the information by asking his school; they don’t need to collect data on him in March, just so they can share their evaluation of him in October. #2: Ian doesn’t need the stress of a high-stakes test that adds nothing to his education. First, this test will be used as an evaluation of his teacher. His teacher has nothing to do with his learning issues. As a matter of fact, she is working hard to make Ian as successful as possible. The thought that his poor performance on this type of test could result in a bad evaluation of his teacher devastates me. I don’t want to do that to her or any other teacher. I know my high-school students are worried about how their performance will affect me. Children don’t need that kind of pressure. Second, Ian doesn’t need the stress of a test that will label him as “partially proficient” or “below proficient.” Ian will deal with enough labels in his lifetime; he doesn’t need some arbitrary label from a test that only measures a small portion of his abilities. These tests don’t measure the things Ian excels at like art, music, spatial reasoning, and verbal communication. #3: State tests weaken his education. Because of the new importance placed on these state tests, most elementary schools halt normal educational practices, so students can participate in a number of standardized test preparation activities that have nothing to do with real learning–it’s just test-taking strategies. This time could be spent on teaching children to think for themselves instead of how to “perform” properly for the government and the big businesses making these tests. The actual time spent taking the tests does the same thing. If people are wondering why our students are falling behind other countries, they need to look no further than the hours spent every year on preparing and testing our students for these standardized tests. #4: These tests will measure whether Ian is at the same level as the rest of the students in 3rd grade, which we already know he is not. He is making progress, but Ian is still at least 6 months behind most of his classmates. Testing him at a level we all know he is not at is a waste of time and money. Opting Ian out may not get the time and money back, but it is sending a message to the state that they will continue to waste their time and money on Ian and other students who have parents opting their children out. #5: Because of the current culture in education, Ian hates school. Outside of school, Ian is a curious boy who loves to learn and teach other people what he has learned. This is why my heart breaks every time Ian says he hates school. How can a boy so full of curiosity hate school? Because to Ian, school is punitive; it is not a place where he gets rewarded for his natural curiosity; it is not a place where he is taught what he is ready to learn when he is ready to learn it. The current culture of school is not meeting his needs. He has to learn what the standards tell him to learn. Teachers are being forced to get students where the state tests say students should be for each grade level by March. What makes matters worse is that with all the budget cuts made at the district and school levels to pay for these state tests, class sizes are getting bigger because there is no money to hire more teachers; therefore, Ian cannot get the individual attention he needs to catch up. Opting Ian out of these state tests will help Ian become a healthier, more confident student–I am certain of that. If I allowed Ian to follow the same path of so many children before him, children who learned differently but were told they didn’t measure up to the state’s expectations of them, I’m afraid the beautiful light in his eyes will fade until he becomes one of my sad juniors who cannot engage with their education anymore, or one of my repeating seniors who will eventually drop out of school because school did not meet their needs. Ian will not become another dismal statistic–not on my watch. I know Ian’s story is not unique; there are too many students like him. I see what they become when they get to high school. I don’t want that sad fate for my child or anyone else’s for that matter. I believe 100% that this test does more harm than good for children. I hope more parents take a stand this year and fight against state testing. Let’s send a message to the government that enough is enough. If anyone is interested in taking a similar stand, here is a link to the United Opt-Out Organization (Link) for additional information on movements around the country. This entry was posted in Advice For Parents, Come Hell or High Water, Education Reformation, Pauline's Soap Box and tagged Children, Education Reformation, Family, Parents, Students, Teaching. Bookmark the permalink. I have a daughter with ADHD who learns differently from other children. She’s a junior in high school now, and it has been a long, hard road for her. I didn’t even know you could opt your child out of state testing, but if I could do it all over again, I would do that for my daughter. She is very smart with tons of energy and creativity, but she hasn’t seen herself that way, because school has been such a challenge for her. The schools like to say it isn’t an option, but as parents, we have a say on what happens with our children’s education. No one has the right to collect data on our children without our permission. That’s all state testing does–collect data on children. It doesn’t teach them anything and it isn’t diagnostic. I wish more people knew about their options, so we could fight this movement. Thanks for your comment, Wendy! I have already had to hold my twin 9 year olds back in 2nd grade due to the fact that the system is completely broken with resistance from not only the school but also the district office. We were told that 3rd grade had the NESA testing and it was required. My daughter is currently in second grade and is now so far behind due to the high standards that she feels “stupid” and is completely lost. I am now AGAIN put in a position that we might have to hold her back like my twins. The system makes me sick. They wake up go to school work all day on school work and come home and we have screaming and crying for 2+ hours over homework that takes all night almost right up to bedtime and then sleep. The next day it starts all back over again. When are they supposed to be a kid and find themselves? I will be talking to the principal first thing tomorrow morning to opt my boys out of the remainder of their standardized testing. I’m so sorry that this is happening to your children. It makes my heart hurt. Please look for the comment by Grian McFadden. There are some great alternatives to public school in that post. In the mean time, I’m so proud of you for being willing to fight for your children’s education. Ask that they be taught where they are, rather than where the school wants them to be. You have more power and rights as a parent than they would have you believe. The common core is insane, do not blame the children in any way. You have to understand everything behind common core and try to stop it. 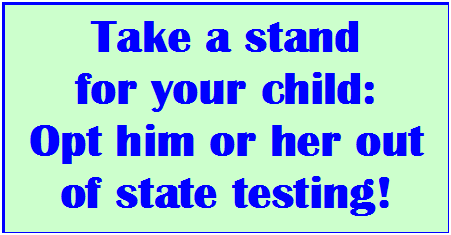 Refuse the test, you have a right to refuse the tests for your children. But if we do not stop common core, and race to the top, and no child left behind, we will have no say at all in our schools. Please investigate common core and tell others what you find, watch the video on youtube, “Building the machine”, investigate. Opt Outs don’t lower the school’s score. They are excluded from the tally. I applaud your courage and outspokenness. I homeschooled our two kids for several years, and put them in school in late elementary grades. ITBS scores in upper quartile, reading at ‘grade 13’ whatever that means according to MAP testing on entry, by 10th grade that all had been crushed. I would never put my kids in this local system if I knew then what I know now. I’m trying to give parents a heads up for what’s ahead. I know how you feel. That’s exactly why i want to fight to fix what is happening! Thank you for sharing your story, Frances! I would love to talk to you through email about some very similar situations I am dealing with as well. One is that after 19 years of teaching I too am considering leaving the profession. It scares me to death and I have no idea what I would do. I really don’t want to leave teaching. It breaks my heart. But physically and emotionally it has almost destroyed me. In fact I am on a 5 month leave of absence do to some soul searching. Also, I have a son who is ADHD and as a parent and teacher I STRONGLY disagree with all this worthless testing. Could you give me some more information about opting out of testing. I did not know this was a possibility. My son scored a 3 on reading EOGs last year but a 2 on the reading. This goes along with his ADHD because the reading requires him to sit and focus longer which is a constant struggle for him. In fact, and I know I’m Mom, but he is actually quite bright and has a vocabulary that wows most people. But once again, the testing will not show this, only that he doesn’t meet the standards the state decides it expects (we are in NC by the way). Anyway, enough said for now but I would love to discuss things with you some more. You have inspired me. I’m sorry you are having a hard time. I understand what kind of pressure you are under. Feel free to email me if you have more to discuss, but check out the unitedoptout.com website for more information about your state. I also have a link to a simple letter I used for opting my son out of tests in this post. Your son doesn’t need the pressure, but you can also reinforce that these tests do not measure intelligence; they just measure whether a student is good at taking tests. Hang in there!